Excelligence Learning Corp., a K–12 technology provider, is almost ready to launch its first digital product. The Really Good Stuff Digital Learning Collection from Excelligence's subsidiary, Really Good Stuff, LLC, is expected in time for back-to-school activities in elementary schools. It will be made available in both the Apple App Store for iOS devices and the Google Play Store for Android devices. 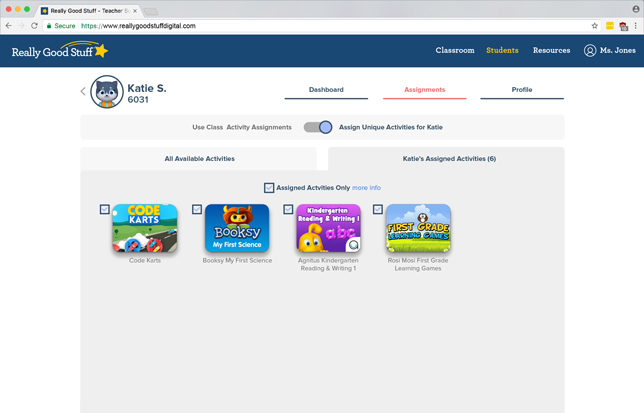 According to the company, the 150-plus apps are intended to serve as supplemental K–2 curriculum — games, puzzles, books and downloadable worksheets — that adhere to national, state and Common Core learning standards. Coverage includes math, language arts, STEM, critical thinking and social-emotional learning, among other learning categories. 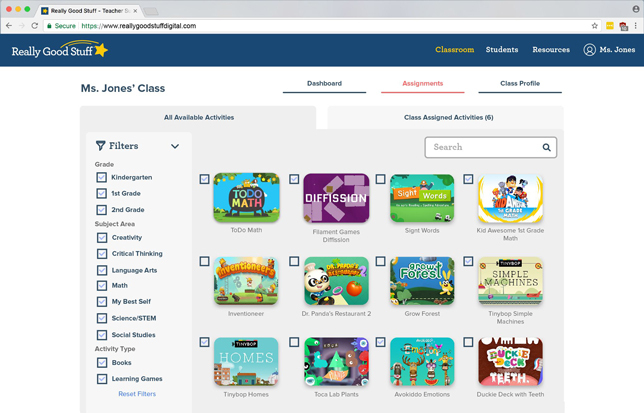 The class assignment search screen in Really Good Stuff Digital Learning Collection from Excelligence Learning Corp. The program includes a teacher center that helps educators filter choices by grade, subject, standard and activity type. Teachers can also track student progress through the dashboard, view trends on student preferences and access printable resources. One educator who tested the new collection said that she "loves" being able to manage her students' activities from the Teacher Center without having to worry about "them accessing content on their own." Jennifer Tuozzoli, a kindergarten teacher in Connecticut, added that she likes being able to track student progress and assign new activities "based on their needs on any given day." An individual student assignment screen in Really Good Stuff Digital Learning Collection from Excelligence Learning Corp.
"I do a lot of small group instruction and I can see myself assigning activities from [Really Good Stuff] to the students who need to practice a math concept or language arts skill while I spend extra time teaching the concept to students who need more instruction," the teacher noted in a prepared statement. "I especially like that I don't have to worry about students accessing content that hasn't been assigned or encountering in-app purchase offers." Really Good Stuff Digital Learning Collection for iOS and Android mobile devices will be available for download in September.